This is the last of four posts this month commemorating the 35th anniversary of the Marathon of Hope. Terry Fox was unknown to most Canadians when he began the Marathon of Hope on April 12, 1980. Five months later he was a national celebrity. Calls to commemorate Terry Fox and mark his achievements for future generations began within days of the end of the Marathon of Hope. Terry himself had presciently said in a July 1980 speech that he “might not make it. And if I don’t make it, the Marathon of Hope better continue.” When the run finished on September 1, 1980, Canadians began to scramble to find ways to honour Fox’s work. Within days CTV announced “The Marathon of Hope Continues: A Tribute to Terry Fox.” News anchor Lloyd Robertson hosted a star-studded telethon featuring John Candy, Al Waxman and Karen Kain. Ten million dollars was raised in one night. That week the Canadian Cancer Society also reported being flooded with calls and donations. In letters to the editor Canadians suggested that Fox be awarded the Order of Canada, which he received in a special ceremony in Vancouver on September 20th. Canadians also wrote and called Fitness and Amateur Canada (FAS), a federal government ministry at the time. 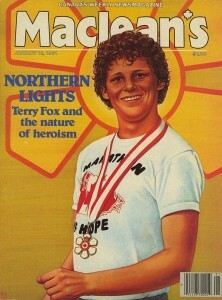 In a memo sent to the Assistant Deputy Minister of FAS on September 5, 1980, just days after Fox ended his Marathon of Hope, a government official wrote that she was receiving numerous letters and calls asking the government to recognize “Terry.” The memo writer recommended that FAS appoint someone to work specifically on communications related to Terry Fox. This memo stands out to me for two reasons. First, because citizens were driving demand to commemorate Fox, and second, because the writer called Fox by his first name. For a government memo, it is unusually affectionate. Whoever reviewed this plan uncharitably called it “pure schmaltz” but it was filed and preserved for posterity by Library and Archives Canada. Interestingly, a similar Terry Fox school run program has since been put into place across Canada. 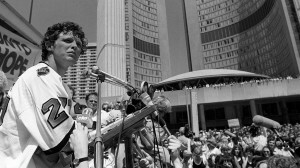 In 1980 journalist Rick Groen noted that the media had picked up on public sentiment and largely avoided criticizing Terry Fox. Groen’s remark was prescient. From the beginning of his run to the present perceived criticisms of Fox are not well-received. It is now well-known that behind the scenes Fox sometimes bickered with his driver Doug Alward and brother Darrell Fox. But when, in the midst of Terry Fox mania, a August 1980 Globe and Mail feature reported that a Canadian Cancer Society (CCS) official said Fox “gets easily upset over small details” and that he was bossy with Darrell, reaction was swift and angry. The CCS demanded an apology and Fox grew wary of the press. Readers wrote letters to the editor calling the story “mean-spirited,” “irresponsible,” and “insensitive.” Very early on Canadians felt protective of Fox. They were committed to this powerful new symbol of their nation and had no desire to cut this particular “tall poppy” down. There was no danger that Fox would be forgotten. Along with the order of Canada, while he was still alive the runner received the Order of the Dogwood and the Lou Marsh Trophy. News editors named Fox the 1981 “Canadian of the Year,” putting Prime Minister Pierre Trudeau and diplomat Ken Taylor in a tie for second. Since his death a mountain, children’s books, biographies, two television movies, a stamp, statues, schools and stretches of highway have been named after fox. iRun magazine also reports that there is a movement to rename Vancouver airport after Terry Fox. I thought that after I’d spent a few hours of sifting I’d become immune to the sentiments expressed inside them, but no, I never did and I doubt I ever will. Their messages are too pure and too real…I don’t think I’ve ever felt as safe as I did for that brief one-minute window on a Vancouver weekday, surrounded by the goodwill of so many Canadians. Collectively, those names testify to something divine – our nation, our home and our soul. While I’m wary of reading Terry Fox as a metaphor for the nation, my research does show that Terry Fox mania was driven by everyday Canadians. Citizens wrote to politicians, government offices, newspapers, the Fox family and the Canadian Cancer society because something about the runner’s activism moved them. This sentiment matters to our understanding of his story. Two recent commemorations for this month’s 35th anniversary of the Marathon of Hope see Fox somewhat differently. iRun magazine has released a feature issue on Fox with new reflections from Darrell Fox and Rick Hansen. Fox is called a running hero in this issue. He is described as an icon for Canadian marathoners, a pioneer of adaptive running, and one of the first athletes to use sport to raise awareness of social issues. The Canadian Museum of History exhibit (and book) Terry Fox: Running into the Heart of Canada casts Fox in yet another light. Here Fox is depicted as a folk hero. Canadians related to him as a brother, son, and emblem of their desire to beat cancer or reimagine disability. At the end of the exhibition viewers can see two cases of tributes to Fox sent to his family, including the crochet patch shown here. The museum has also digitized thousands of letters written to the Fox family, searchable by writer or hometown. How we remember people like Terry Fox matters. It is this issue that is at the heart of the debate about the meaning of Fox’s disability, which I discussed in my last post. 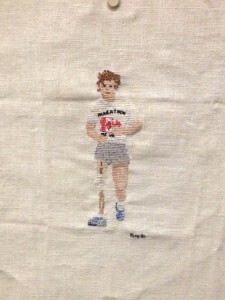 One of the reasons I’ve been doing this series is to think about the meaning of Terry Fox. Is his significance to Canadians rooted in his personal qualities, like courage? Or is Canadians’ love for Fox based on something else – some sort of public need for heroes or to valorize this nation? Ultimately, I think it is both of these things. As an individual, Fox had qualities that people want to believe are essentially Canadian: he was strong, articulate, and quietly courageous. In terms of the zeitgeist, I think that Fox may have captured the imagination of the public in 1980 because his effort to run across the country symbolized the unity for which English Canadians hoped. But parts of Fox’s story are also forgotten, or at least not fully at the surface of how we talk about him. Unity debates, along with the runner’s masculinity, disability, and religion are often downplayed in stories of Terry Fox. Conflict is erased in favour of focusing on Terry Fox’s inspirational story. But it is the combination of conflict and ambiguity with enthusiasm and celebration that make the Terry Fox story so special, and so I want Canadians to remember that, too. Jenny Ellison is an Assistant Professor (CLA) of Canadian Studies at Trent University. Her website is www.jennyellison.com and you can follow her on Twitter @thejennye. May 27 you can see her Buzzfeed-inspired “Five Things You Don’t Know About Terry Fox” lecture free at the Danforth/Coxwell branch of the Toronto Public Library. The talk is part of the “History Matters” lecture series on sport presented in collaboration with ActiveHistory.ca.